COP21 – is 5 years better than 10? As COP21 starts and the negotiators face the task of reaching an agreement, one of the most important points of discussion will be the review and recalibration of INDCs. Many organisations, including some business based ones (i.e. We Mean Business), are arguing for a five yearly review of the national contributions. If strictly adopted, this might mean that the first round of INDCs are already under review before they formally commence (i.e. 2020), such that the global emissions outcome by 2025 is already lower than current INDC projections would project. An alternative is a 10 year review, such that the first deviation from current INDC projections becomes apparent in the early 2030s. There are practical considerations associated with this. Many who view the energy industry from the outside have consistently had expectations for rapid change. For example, the UNFCCC itself has continued with its pre-2020 workstream even as the time for meaningful change has diminished. This isn’t to argue that nothing can happen between now and 2020, but it is unlikely that much extra can now happen in that time frame. The energy industry is built on long lead times, project cycles that can stretch out to a decade and capital cycles that are often laid out years in advance of actual spending. Sometimes this can be disrupted, particularly when there is a sudden shift in market price structure, but that is not the normal pattern of change. There is also the reality of policy development timelines needed to trigger change. For example, the EU is in the midst of a three year (at least) examination of the climate and energy needs for the period 2020 to 2030, which requires green papers, white papers, various stakeholder consultations, draft legislation, parliamentary committee discussion, a parliamentary vote, Member State agreement and transfer to national legislation. It is unlikely that this would be revised as soon as 2018-2021 having just reached agreement on the entire package in 2016 and finalised EU wide adoption in 2017. The institutional capacity may not exist for constant revision. 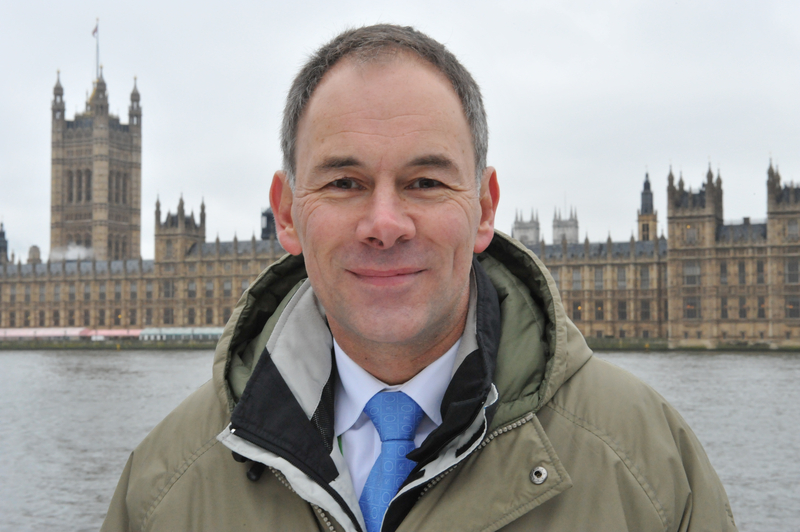 But there is an overriding thought which should take priority – the emissions and therefore eventual temperature impact of moving to a more aggressive review timetable. It is very clear that the current round of INDCs do not deliver a 2°C pathway – many analysts and the UNFCCC have concluded that. The INDCs also say little to nothing about the past 2030 period, so future INDCs or review of current INDCs will be needed. There isn’t really a clear emissions trajectory for the current round of INDCs, at least not after 2030. For the purposes of this analysis I have assumed that they result in peaking of global emissions in the 2030s, followed by the beginnings of a decline to 2040 and beyond. Some would argue that even this is optimistic. The 2°C pathway reaches net-zero emissions in about 2080, then enters a period of negative emissions through the use of a technology such as BECCS (biomass energy with carbon capture and storage). In the case of a five year correction process, I assumed that every five years the UNFCCC looks at progress against a 2°C pathway (which of course will change over time, but I haven’t got into that detail) and after each new round of submissions the INDC pathway, as it would be at that point in time, shifts a quarter of the way further towards the 2°C pathway. The result is an emissions trajectory that starts to deviate from the current INDC pathway by 2025. In the case of the ten year correction process, the same happens but on a ten year cycle, with the intervening five year period declining at the same rate as the previous five year period. 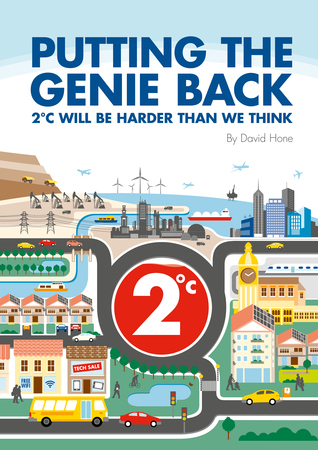 Because of the slower turnaround in the process, I also assumed that after a more protracted INDC discussion, the shift in the pathway is relative to the 2°C line as it was five years earlier, rather than at the time. As such, there is a bit more lag built into the process and emissions remain the same as the current INDC pathway until after 2030. The chart above shows the four potential pathways; 2°C, the current INDCs extended out for several decades and the corrected pathways, based on five year and ten year correction cycles. 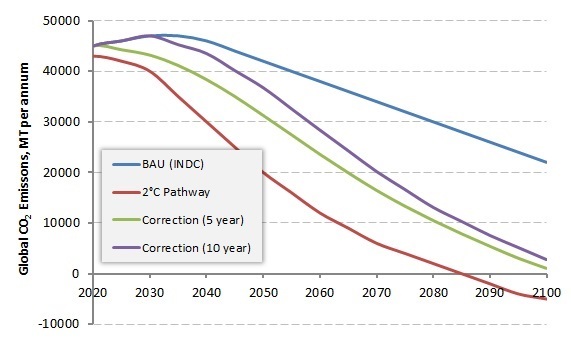 As shown, the uncorrected INDC pathway is a 3+°C scenario, whereas both the five year and ten year correction pathways are about 2.5°C and both arrive at a net zero emissions outcome around the turn of the century. As such, it is clear that a review cycle can change everything and has the potential to deliver a clear outcome rather than an open ended emissions tail stretching well into the 22nd century. But the difference between them is 0.15°C, or a cumulative 280 million tonnes of CO2 over the balance of the century. While this is not insignificant, the more important goal for the negotiators should be to agree a clear review and recalibration process, rather than be too focussed on the precise timeliness of it. COP21: How are carbon markets doing? If you mean a pavilion or display in the Green Zone, the answer is no. David, you just lost all your credibility with this one. Trying to sound scientific, showing charts and calculations about something which is obvious: a 5 year reassessment is better than a 10 year one. Yet you are desperately trying to come to a different conclusion. Whom do you think you are helping with this? Why do you think the leaders of 195 nations came together, because they are bored, or in lack of attention? It was the public pressure and the scientific evidence. As a result of this ongoing pressure there will be actions made, like it or not, which will make the life of fossil fuel companies harder day by day. Trying to give the impression that this won’t be the case, showing faulty analysis maybe to your decision makers as well just gets your company closer to complete failure, not further away. I think you have missed the point – of course 5 years is better than 10, but the difference is surprisingly little. I actually expected it to be more. The big difference is in the policy making, which will have to be in a state of constant review if the direction is changed every five years. When I wrote this there was quite some debate about 5 or 10 year reviews, but the issue is settled now. In practice, I suspect the actual change in ambition will be less often than 5 years.